Starting from the end of September, 2015, Star Micronics Co., Ltd. will launch to the market our new product “mPOP”, which consists of a new concept that a 2 inch thermal printer and a cash drawer are combined into one housed product. These days, Star has seen the big growth of mPOS (mobility POS) demand which utilizes tablet devices and smart phones for payment. This new product is the best solution for such mPOS usage and definitely focuses the ease of use pursuing the best design and functionality in the stylish POS environment. Just with the “mPOP”, customers can cover all the work and POS environment which otherwise would have required the purchase and set-up of printer and cash drawer one by one (*1). The existing printers and cash drawers were given little importance to their design and given larger sizes due to the condition requiring the communication with POS terminals or PCs. The shops with mPOS system are normally design-conscious shops such as beauty salons and apparel shops, therefore the POS devices should have harmony with the shop interior. 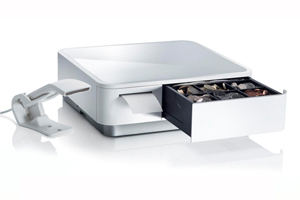 The new product, in spite of its all-in-one configuration having printer and cash drawer inside, is very stylish from 360-degree view and will not be even recognized as a printer or cash drawer thanks to its compact appearance in comparison with existing standard cash drawers. The drawer opens driven by electric motor so it is very quiet and will keep the shop atmosphere from spoiling by large sound. The communication with host devices (tablet, smart phone or PC etc.) are via dual interface, Bluetooth and USB. There are 4 additional USB ports which can power the peripheral devices and communicate with those like barcode scanners (*2). They are also capable of charging tablets, which helps unify the complex wiring to only one power cable to “mPOP”, and the bottom plate is designed to house the wires of peripheral devices, which results in very neat table top. The printer has convenient de-curl function to avoid giving curled receipts. All what is needed in the actual use such as tablet stand, sample roll paper and power cable is packed together in the box (All-in-one package), so it is ready to start, once host device arrives. Similarly the store applications (* 3) and online manuals are available anytime to support customers to make initial installation and configure settings. Star will sell worldwide the new product to USA, Europe and Asia as well as Japan and will target the sales volume of 140 thousand units until 2017 yearend. Star is proud of our high market share of mPOS printers and will try harder to expand it further more by enriching our mPOS product lineup, a part of which is this introduction. (*1) In addition, host device and application are necessary to control the mPOP. (*2) The peripheral devices designated by Star Micronics. (*3) Applications designed to use in iOS or Android which are available in App Store or Google Play. » Minimum footprint possible for a thermal printer and cash drawer combined product. » Color selection from Snow white and Piano black appealing the beautiful appearance from 360-degree view and high-class mood. » Together with the mPOP, the box has everything such as tablet stand, sample thermal roll paper, power cable, mount bracket (to anchor the product) and barcode reader (according to the version). » The bottom plate has channels and hooks to house and keep inside various cables. » Has capacity to power peripheral devices and charge tablets and unify the wiring to only one power cable to mPOP. » Connectable with host devices via Bluetooth or USB interface (Dual interface). » Connectable with tablets and other peripheral devices designated by Star Micronics via each of the 4 type A USB ports (0.5A x 2 / 1.5A x 2). » De-curl function (to avoid giving curled paper). » High quality 2 inch thermal printer easy to change paper roll. » Quiet drawer driven by 5V motor. » Security with electronic lock key. » Tray for 4 types of bills and 6 of coins. Additional storage space beneath the coin tray. Original design for coin space adjustment and easy bill pick-up. » The online manual (HTML) is available anytime, which always promises the latest documentation is accessible. » Simple and easy-to-understand API, source code and manuals. » Modifiable from 3 inch (80 mm) wide graphic printing format to 2 inch width (58 mm) by print reduction function. Customers who use 3 inch Star printers can print from mPOP by minimal application modification. » 1D USB barcode reader best matching the mPOP design is included (according to the version). The barcode reader communicates with the tablet via mPOP Bluetooth. -mPOP is a registered trademark of Star Micronics Co., Ltd..